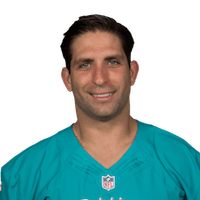 Published: Oct. 22, 2017 at 02:18 p.m.
Miami Dolphins quarterback Jay Cutler finds tight end Anthony Fasano for a 4-yard touchdown. Published: Oct. 18, 2015 at 03:42 p.m. Published: Dec. 17, 2012 at 07:04 a.m.
(3:17) R.Tannehill pass short left to A.Fasano for 2 yards, TOUCHDOWN. Published: Dec. 16, 2012 at 03:45 p.m.
Miami Dolphins quarterback Ryan Tannehill finds tight end Anthony Fasano for a 2-yard touchdown pass vs. the Jacksonville Jaguars.